commented on "Antique Rocking Chair Reupholstery - We love restoring antique and vintage chairs!" 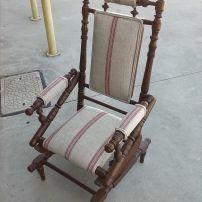 Antique Rocking Chair Reupholstery - We love restoring antique and vintage chairs! We love to bring these beautiful old chairs back to life. If you have an old favorite whether it be antique, vintage or a traditional chair we can help you restore it so it can be handed down the generations. Large selection of fabrics to pick from!